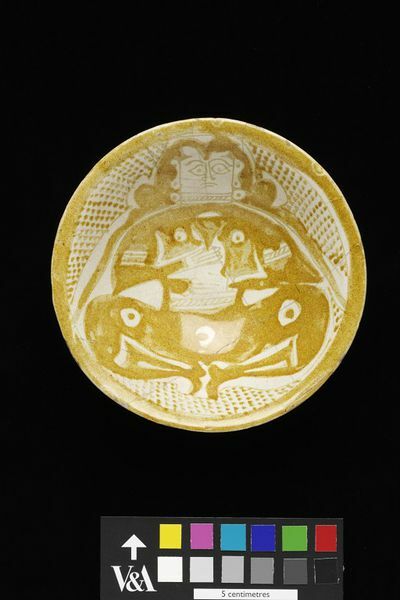 This bowl features an image of a seated drinker, who is depicted in a rather naïve style. The bowl belongs to a type of Islamic pottery known as Abbasid lustreware, which was produced in Iraq after the Abbasid dynasty of caliphs had established their capital there in AD 750. During this period, Iraqi potters developed a type of earthenware with an opaque white glaze in imitation of the white porcelains then being imported from China. They subsequently applied the technique of staining glass with metallic pigments to this whiteware and in the process created the world's first lustre-painted ceramics. The decoration here is in the monochrome yellow lustre typical of surviving Abbasid lustrewares. After a short period of experimenting with polychrome and two-colour lustre decoration, Abbasid potters settled on this yellow pigment. The reason may have been its greater dependability during the firing phase. The more likely reason, however, was that it resembled gold. Achieving a high quality yellow-gold lustre was difficult, because the lustre will not develop properly unless the firing conditions are precise. It was also expensive, since the pigment used was silver oxide. These wares also cost a good deal to produce because the tin oxide required to make the glaze opaque and white had to be imported. 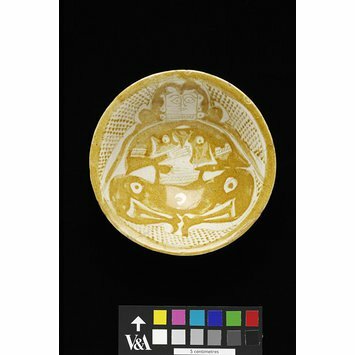 Bowl, buff-coloured earthenware (fritware), covered with a tin-opacified glaze, the glazed surface painted a yellow-gold lustre depicting a seated figure holding a goblet within contour panels against a dotted ground. Bears label with initials "PH" in monogram. Bowl, whiteware, painted in gold lustre with a seated figure holding a goblet; Iraq (probably Basra), 10th century. BOWl, earthenware with lustre decoration. The two bowls represent a later phase in Iraqi lustre production. Only one metallic pigment was used, but it has a more reflective surface. The decoration was inspired by silverware of the period, which was sometimes decorated with humans and animals. Even the dotted backgrounds reproduce the texturing of silver.